Invasive grass is taking over the Brotherhood Bridge meadow. This biologist is trying to save it. John Hudson is waging a war against a silent invader. After trooping through a dense and soggy wetland Wednesday, he arrived at the front line where an invading army of reed canarygrass is marching steadily forward. 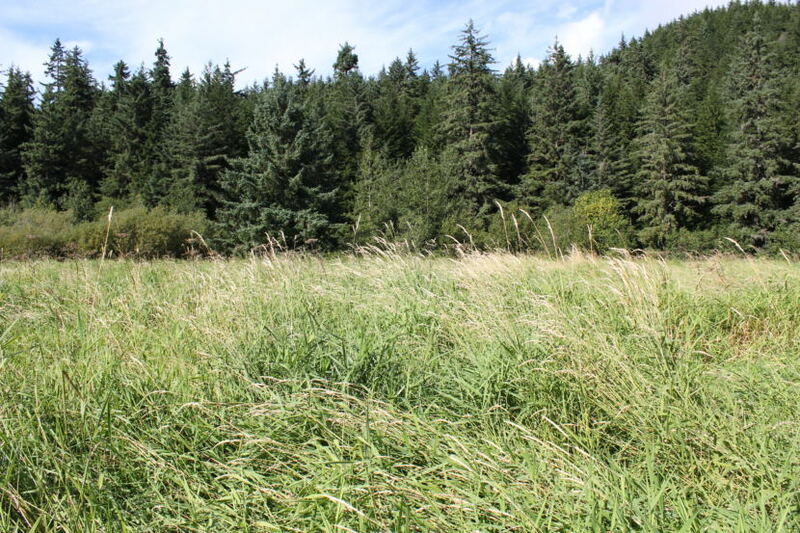 The tall grass is common in the Lower 48, but it’s relatively new to coastal Alaska. And it’s making its presence known. “There are a few native plants here and there but they’re not long for this world because they’ll succumb to that reed canarygrass,” he said. Hudson is a biologist for the Southeast Alaska Watershed Coalition. A few years ago, he discovered what he calls the “megapatch,” a vast swath of canarygrass slowly advancing across the Brotherhood Bridge meadow. Most people wouldn’t notice a wetland under siege by reed canarygrass. It’s superficially similar to native grasses, but it can quickly transform an ecosystem. “The worry here is that it’ll expand and take over all this habitat and we’ll lose a wonderful meadow that Juneau people enjoy,” he said. 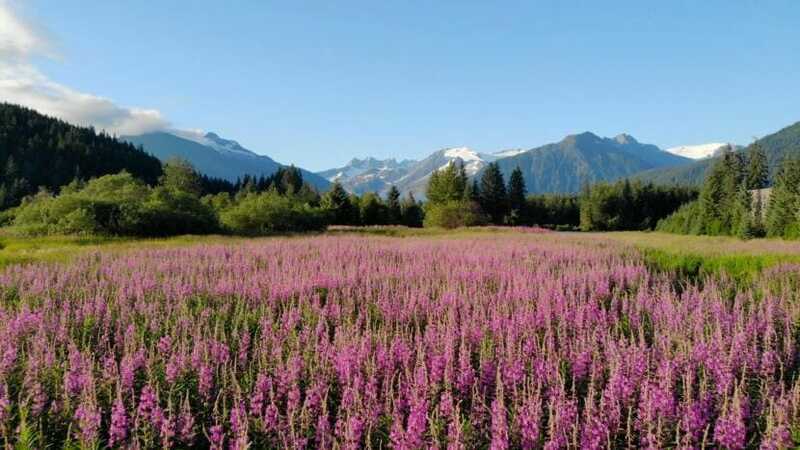 The image of the Mendenhall Glacier behind a field of violet fireweed is ubiquitous in Juneau. In downtown shops, you can find it on postcards, coffee mugs, calendars—even the Alaskan Fudge Company put it on their box. But its value isn’t just aesthetic. Meadows are rare in tree-covered Southeast Alaska. That means they provide unique habitat for plants like cow parsnip and nagoonberry. Those native meadow plants provide food for insects, which in turn provide food for birds and small mammals. But reed canarygrass leaves little room for other plants. It conquers meadows and leaves them sterile. Hudson said it’s like replacing a forest with a parking lot. 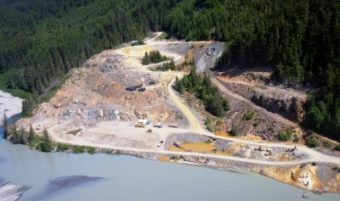 “And so we’ll lose that complex habitat that we had and all those animals that depend on it over time,” he said. Native plants just can’t compete. The canarygrass grows tall, blocking out the sun. It’s roots are voracious and crowd out other plants. It reproduces quickly and when it dies, it leaves behind a thick thatch that forms a barrier against other plants. Hudson said the grass’s resilience isn’t accidental. For centuries, people have used its roots for food and turned its long, coarse stems into hay. Even its leaves have been cultivated. They contain a psychoactive chemical that can be used to make ayahausca. Roadbuilders used to plant reed canarygrass along highways to prevent erosion. Hudson thinks that’s how it got to Juneau. But Hudson has found a way to fight back. He’s exploiting one of the plant’s strengths as a weakness. He said reed canarygrass is the first plant to sprout in the spring and the last to go dormant in the fall. 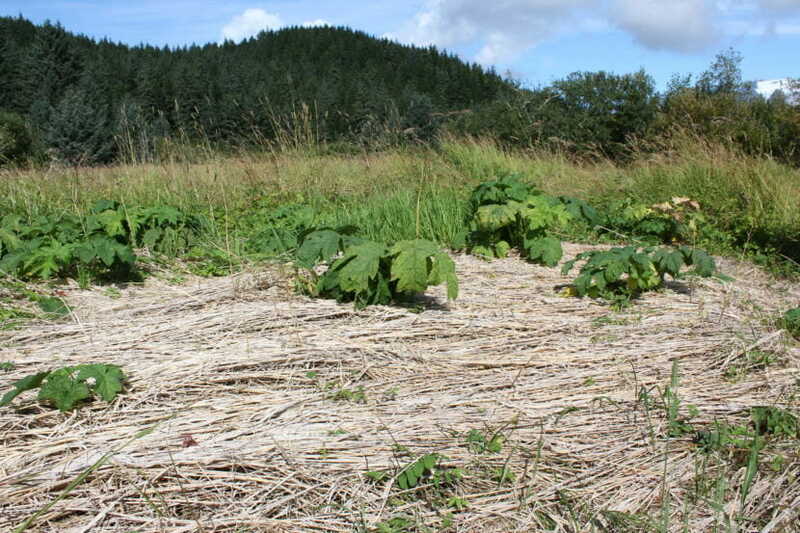 “That creates a great opportunity for invasive plant managers to come in and spray the plant after the other plants have gone dormant,” he said. Returning to a patch he sprayed last fall, Hudson found small Native chocolate lilies sprouting from the withered thatch. Hudson said it’s a start, but there’s still a lot of work to be done. 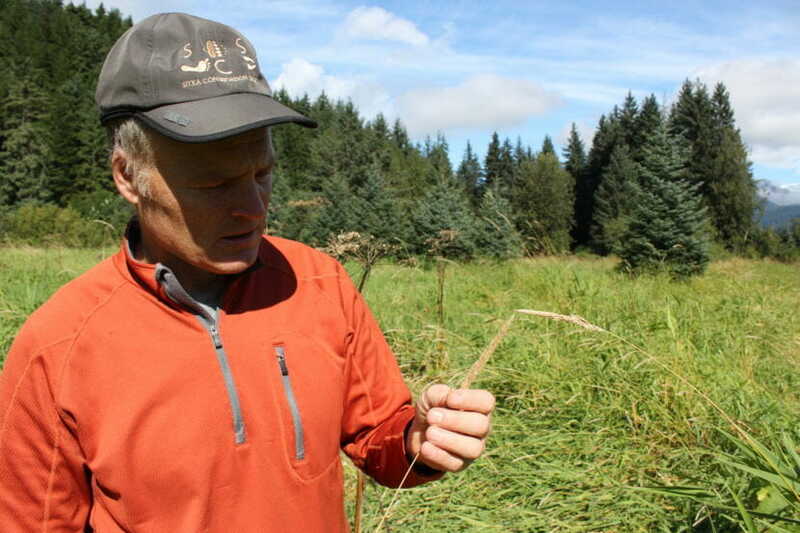 In addition to the meadow, reed canarygrass has been found all over Juneau, including the Mendenhall Wetlands Game Refuge. Hudson said he’d like to eradicate the grass completely, but he’s just an army of one. You can report invasive species to the Alaska Department of Fish and Game online or by calling their invasive species hotline at 1-877-INVASIV (1-877-468-2748).